Roads with a significant gradient, such as you can expect to encounter in mountainous areas, can present the driver with unique challenges that require special skills. 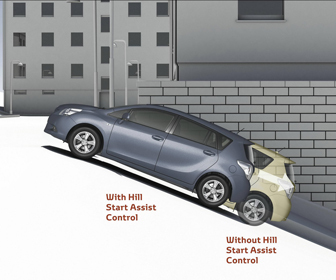 Starting and parking on hills may be challenging to inexperienced drivers due to the fact that the vehicle does not remain stationary when the parking brake is disengaged. Learning a few simple techniques and practicing them diligently whenever you have to drive or park your vehicle on a hill will ensure your safety and allow you to tackle even the steepest of ascents. The choice between an automatic transmission or a manual was always the matter of price, convenience and the available power. A vehicle equipped with automatic transmission offered the driver the convenience of not having to change gears, but it came with a premium: a higher price to start with, lower fuel economy and less horse powers due to some losses in transmission. Over the years, car manufacturers have been able to bring down power losses and increased fuel consumption, but we are still left with the higher initial price. When it comes to driving on steep hills, automatic transmission is usually preferable to the stick shift and it makes most drivers feel much more comfortable behind the wheel by taking out the necessity to learn how to start driving uphill. With automatic transmission, your vehicle will never roll backwards and most modern vehicles have a “hill start assist” feature to help drivers on those especially steep and icy hills. 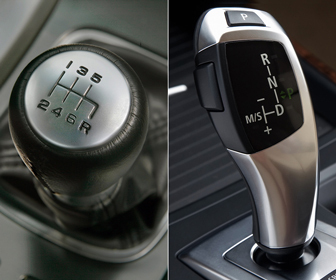 Modern automatic transmissions also offer drivers the ability to shift to a lower gear and use engine braking when driving on steep hills or in the mountains. Considering all of the above pros and cons, we say automatic transmission is the way to go for general public when it comes to tackling a steep hill. What do you do when you stopped while traveling uphill and now you need to start moving again? Of course, it is not even a question for drivers who chose automatic transmission, but is starting on a steep hill with manual transmission as hard as you feared? It really isn't, just follow these easy steps! Keep your right foot on the brake pedal and place your left foot on the clutch pedal. While holding the brakes, slowly depress the clutch pedal up to the point of biting (you should practice this on even ground so you can easily catch the moment of the clutch biting). Quickly move your right foot off the brake pedal onto the accelerator. On smaller hills, your vehicle will be held in place by the clutch alone until you give it more gas. Apply more pressure to the gas pedal and slowly depress the clutch to start moving. Some steep hills will require you to use the handbrake to start moving, check out this article on how to start moving on a steep hill to learn this technique. One thing new drivers are confused about is the direction they need to turn the wheels in while parking on hills. Student drivers are required to learn this as part of the drivers education program since questions about parking uphill and downhill frequently appear on the permit test in almost every state. 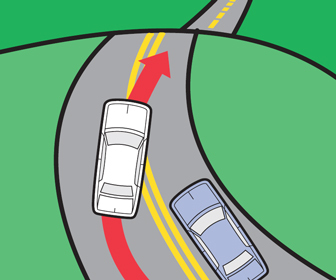 A rule of thumb is easy to remember: turn your wheels towards the center of the road ONLY when you are parking uphill and there is a curb present. If there is no curb or if you are parking downhill, turn the wheels towards the side of the road. Passing is forbidden on most hills due to limited visibility and this is usually reenforced with additional road signs and pavement markings. 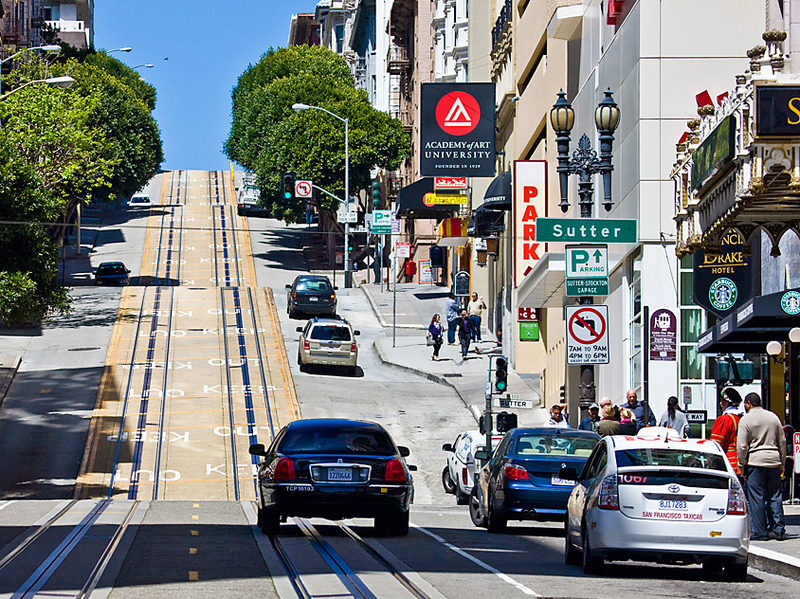 Driving on hills is quite similar to driving in the mountains and you should follow the same driving safety tips. Slow down when traveling downhill. 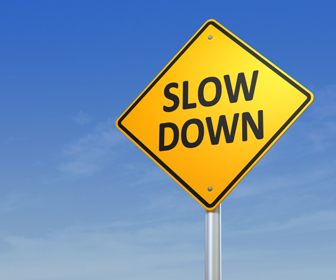 Watch the signs that tell you what speed is recommended and do not exceed it. Depending on road conditions, you may have to travel even slower. Use engine braking. 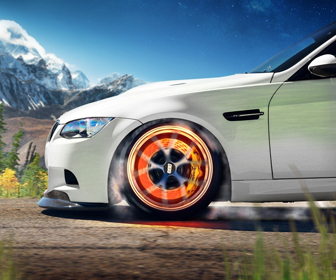 Engine braking takes some work away from the brakes and allows them to cool down when you are traveling downhill so they will not fade when you need them the most. Use lower gears. 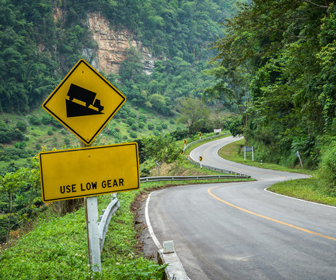 You should use lower gears for both climbing and descending hills. High revs will provide you with more power when you are traveling uphill, when you are traveling downhill, use low gears to brake with the engine. Be watchful. 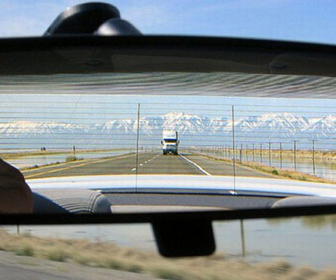 Observe traffic behind you through the mirrors. If you see a large vehicle approaching you from behind at high speed, try to give way if it is safe to do so. Driving in the winter requires the driver to learn a number of new skills and be extra attentive and careful at all times. Some icy hills may be impossible to climb, since the tires will not provide sufficient friction. If there is a way to bypass an icy hill, use it, even if it means traveling a few extra miles. Ice on the road is remarkably dangerous for vehicles traveling downhill. Both gravity and inertia are working together against the driver. Be extremely cautious and travel as slowly as possible when descending an icy hill. Check out these tips for winter driving before you get out there!